Is portrait painting a realm you dare not venture because it seems difficult? 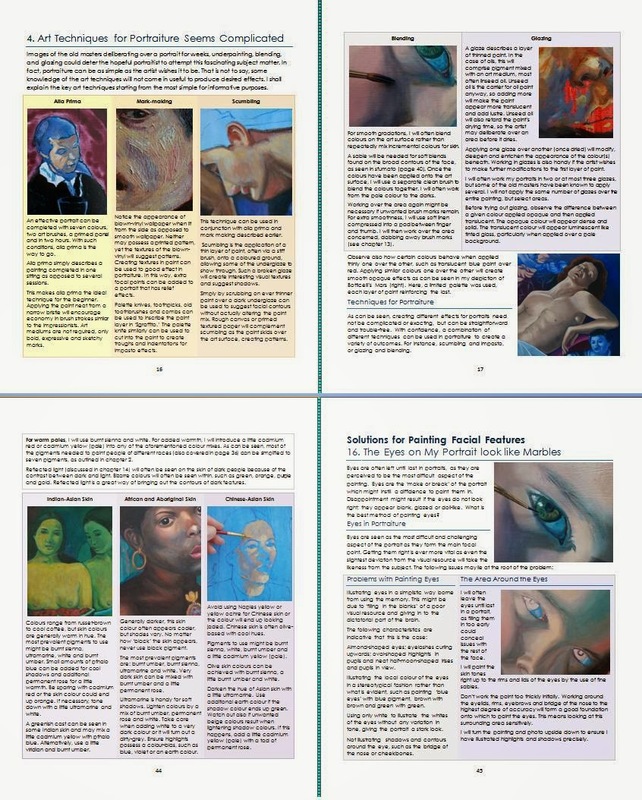 My book Why do My Skin Tones Look Lifeless? Plus 25 Solutions to Other Portrait Painting Peeves might be the answer for the beginner in portraiture. Now available in large edition. When it comes to learning portraiture in art, I have noticed the same issues crop up with fellow students and pupils in my class. Often the developing artist may shirk away from painting portraits as it is deemed less forgiving than landscape art or still life. A less than satisfactory first attempt may deter the artist for good. Noses look skewed, skin tones look washed out or muddy, eyes look like marbles or facial hair looks stuck-on. Seeing such commonplace afflictions in portraiture inspired me to write a troubleshooting guide offering help and advice for artists wishing to learn portraiture. As can be seen from my art book, portrait painting is not what it appears. Really, only 5% of it is line and 95% is color shapes. This is why I feel portrait painting should not be about each feature in isolation, but about how each relate with one another. See Youtube clip to see a slideshow of images within this invaluable book. 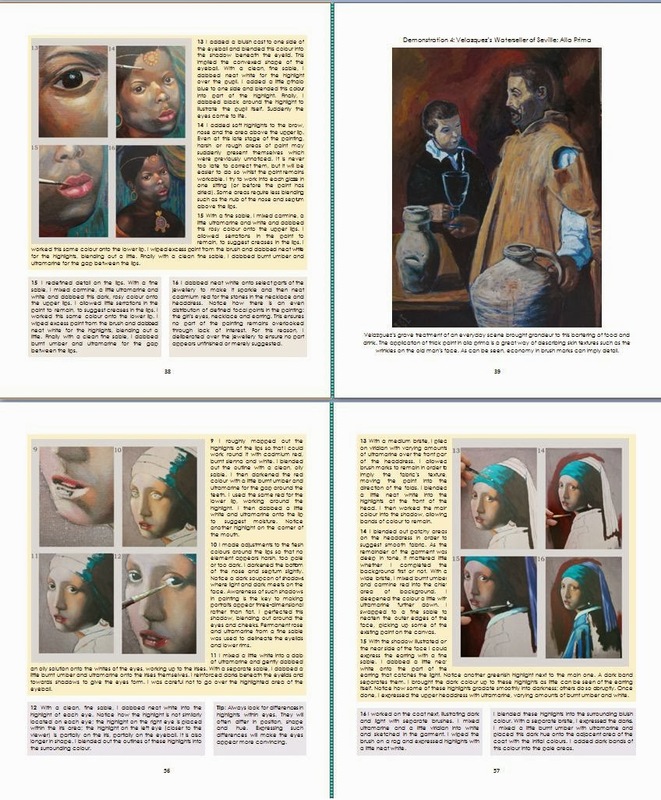 As can be seen from this book on portrait painting, the portraitist does not need an array of art pigments, sables, huge canvases or mahl sticks to produce good portraiture. The basis for my skin colors comprises a mere seven oil colors. I will banish pigments with ‘flesh’ on the label, preferring to mix my skin colors from scratch. The book begins with a preparatory section on portrait painting such as selecting the most suitable art surfaces, the underdrawing, the resource material and the underglaze. Such considerations will increase the artist’s chances of success. 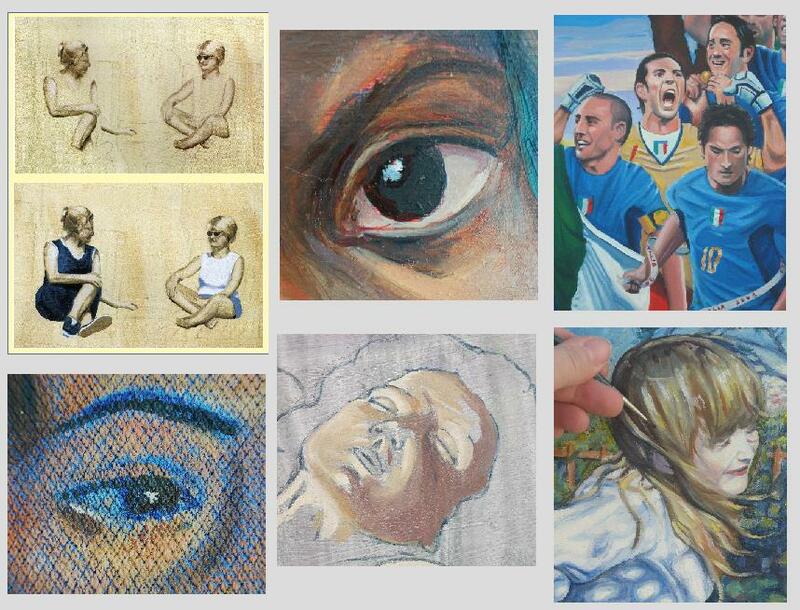 The latter part of my book offers solutions for painting the facial features such as eyes, noses, mouths and hair. Learn also the vital pigments needed for mixing the skin colors of subjects from different ethnic groups, ages and sexes. Eye color from blue to brown, and hair color from blond and ginger to black are also explored. See screenshot of the interior of this large edition book to get an idea of how it looks. Darkening the colour of skin to express shadows are possible without the portrait appearing grubby; wrinkles and other facial textures can be expressed without them looking like lines painted on. Explore the tonality of skin as well as its color. As can be seen, treating the skin colors as the true focal point of the portrait rather than the features forms the basis for great portraits. Also learn how to produce the ideal images to work from, including portrait photography, as a portrait is only as good as its resource material. 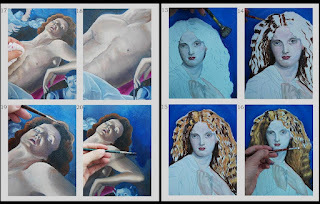 Learn also how to make the most of the life model if opting to paint form life. Effective use of light will help create a portrait that appears more 3D rather than flat. Looking for colours within shadows in the form of reflected light is the key. Art techniques for portraiture from impasto to glazing to scumbling are also explained. This invaluable art book on portrait painting is available on Kindle as well as paperback. Large edition measures 10x8in and 83 pages long, bursting with colour images. The proportion of the pocket-sized edition is 8.5x5.5in and is 142 pages long – a size that easily fits into a bag. Also available on Kindle. Some of the images within this book can also be found in my other guidebook on portraiture, Portrait Painting in Oil: 10 Step by Step Guides from Old Masters. 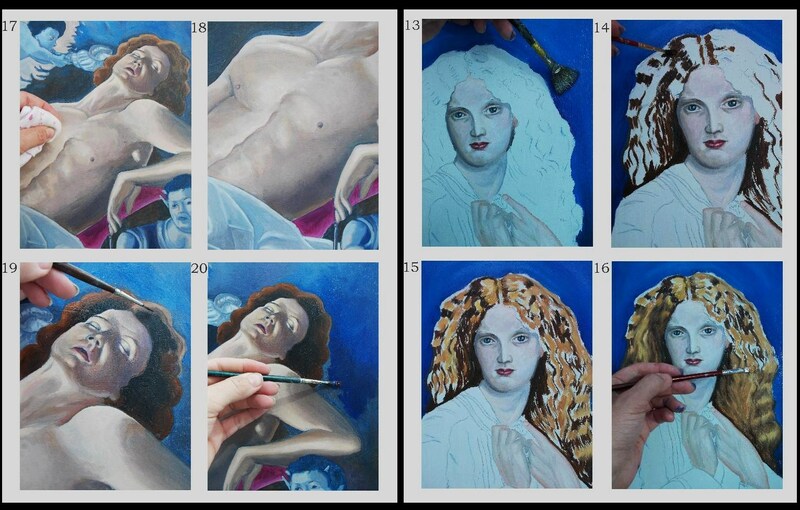 Each project is laid out with prescriptive instructions and accompanying step by step images, ideal for any artist wishing to paint portraits from old masters such as Botticelli, Delacroix or Vermeer. Incidentally, Why does My Skin Tones Look Lifeless? has been included in a book amalgam entitled: the Ultimate Oil Painting Solution for Landscape Art, Portraiture and Still Life. This book is 3-in-one, a tome some 233 pages long, covering all 3 areas of oil painting. Also available on Kindle. Briefly, I have a BA hons degree from Kingston, London and a PCET teaching qualification from Warwick.